Teach your pet some mealtime manners. 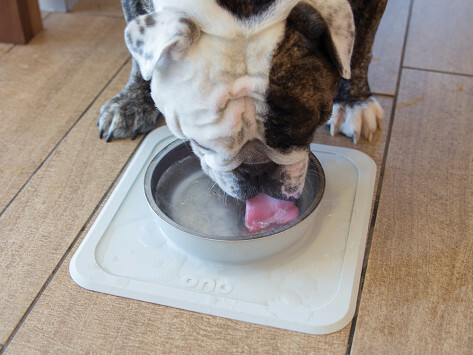 This non-slip silicone pet bowl mat creates a tight seal against flat surfaces, keeping your pet’s bowl in place during mealtime. The mat has a raised inner edge to catch any spills and a tapered outer one to prevent pets (and kids) from pulling up the mat. And the food-grade silicone is super easy to clean. Dimensions: 16 oz. : 10" x 10" x 1.6"; 32 oz. : 11.5" x 11.5" x 1.9"
Weight: 16 oz. : 1 lb. ; 32 oz. : 1.5 lbs. We have 3 cats....they all mess with their stainless steel water bowl. Towels in the middle of the kitchen everyday. Until we got this water water bowl...no more water on the floor! Ono’s raised inner edge catches liquid spills and the tapered outer edge keeps pets and kids from pulling the mat up. 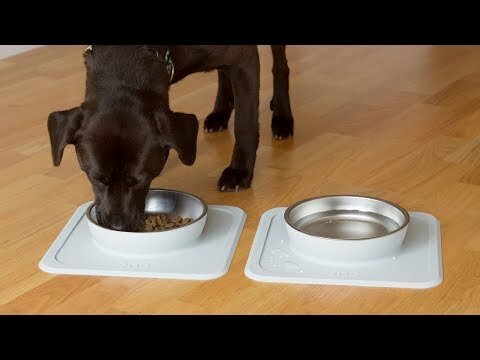 It’s easy for cats and dogs to eat and drink from—and even easier for you to keep the feeding area clean.